Just wanted to be comfortable at work, it has been a crazy long week. I know that next week will be quieter to make up for it. Got to meet and work with some really lovely people, but it was a very busy week that pushed me out of my comfort zone a lot. The stress certainly won't be missed! Last worn: trench coat, printed top, jeans, Wittner heels, Marc Jacobs Fran bag. Today was a lovely warm day, the perfect Saturday. I caught up on blog reading in the morning, ran some errands to pick up some essentials to help DH kick his cold, walked Cooper, and just relaxed and enjoyed having some time to rest. Thought this dress was a lovely choice in the morning, but there was the odd gust of wind to catch the hem that had me wishing I had picked jeans, haha. 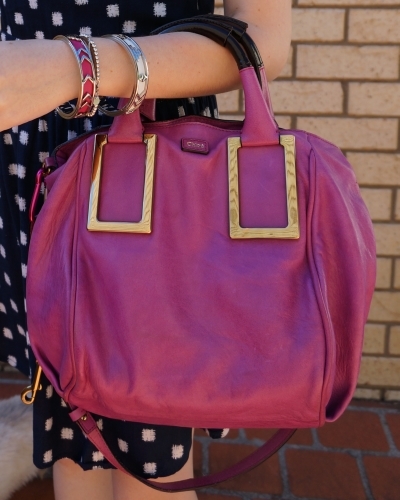 Last worn: pink sunnies, navy dress, shoes, Chloe Ethel bag. I love your pink bag! You are the queen of all bags!! !I love both outfits!! That 1st bag is killing me Mica! How gorgeous! I love your dress. Glad to hear that things will slow down in the coming week. Stress is so not good. Love that second outfit, the pink bag makes everything so cheery! 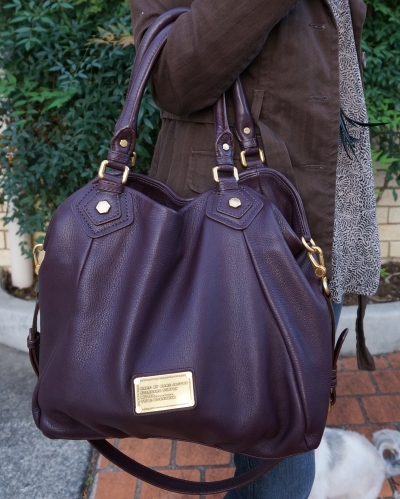 That purple bag is amazing - what a great colour! You have the best bags. Cooper is so adorable - I love his fringe. the first outfit is definitely one of my faves from you so far :) strayed misfits are one of my fave cuts from s&b too. and those heels are such a gorgeous colour. hoep you had a lovely weekend mica! That polka dot dress is so cute, I love it! Mica I really like the brown hues on that first outfit, it looks marvelous with your hair and skin tone - and of course I am mad about the bag.